In July 2015 Satinder Dhillon was the cover story of The Times of Canada. Below is a segment from the article by Bernadette R. Giacomazzo which can be found on the link below or by clicking here. Modern day revolutionary – Businessman, freedom of speech advocate, social activist, and perhaps Canada’s most marginalized litigant, Satinder Dhillon, 37, and his team, have fought a valiant battle over the past 15 years against corporations such as KPMG (the world’s 4th largest accounting firm) and the government in Canada. Despite having his life threatened, Dhillon has challenged, head on, the multi-billion dollar corporations, that seek to silence common folk such as himself, and take their rights away. This is Canada’s own David versus Goliath story. And now Dhillon has founded a national movement that could shake up this country in the coming months, before the next federal election, and for years to come. Dhillon, who has also been writing a book about judicial corruption and white collar fraud, spoke to us, after he completed a historic freedom of speech trial this past February, where he was shockingly denied the right to use the truth in court. Certain branches of the government, for whatever reason, have been providing key assistance to KPMG for over 15 years, and in the end British Columbia Supreme Court Judge Heather Holmes ruled in favor of accounting firm KPMG and the Crown, and denied Dhillon the right to use the truth in court. Satinder Dhillon, is the 37-year-old son of Sikh immigrants from Punjab. He was born in Quesnel, British Columbia, where his father worked in a lumber mill, despite being an engineer in India. Dhillon and his parents moved to Abbotsford, a small farming community — known as the raspberry capital of Canada — when he was three years old, and that is where he spent his formative years. “It’s a familiar story from back then,” he said. “Educated immigrants come from a far off land but have to take hard labor jobs to support their families and make ends meet. Our parents made tremendous sacrifices their whole life so that we could have a better future in this country. And the powers that be are now saying we can’t even use the truth in court. It’s senseless to do things like that for any court, in any country, let alone Canada” said Dhillon. 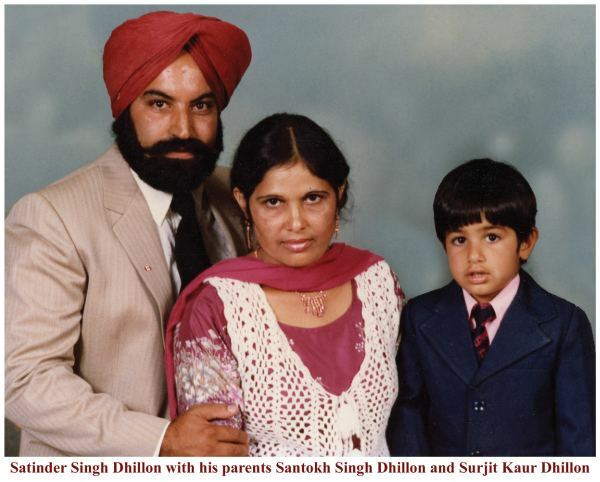 Dhillon attended Simon Fraser University, and the University of the Fraser Valley. He was just 19 years old, and a little more than half way through completing his degree in Business Administration, when he was offered a job at HSBC Finance (formerly known as HFC), as a loans officer. He then went on to work for Vancity (Canada’s largest credit union). Becoming one of the youngest Financial Services Officers in its history. Always the entrepreneur, he began purchasing real estate at a young age as well and buying and trading stocks, when just a teen. Dhillon also worked as a fundraiser for Greenpeace, Red Cross, the Anti-Defamation League (ADL), and PBS among others. After a serendipitous meeting with philanthropist and industrialist Erwin Singh Braich (eldest son of pioneer lumber baron Herman Singh Braich Sr.), Dhillon, with the mentorship of Braich, went on to other ventures, which included mining, commodities trading, technology and entertainment. This is also around the time when KPMG entered into the picture. What Dhillon and Braich uncovered and learned next, was not expected by either of these sons of immigrants who, at that point, had complete faith in the Canadian legal system. Some people have advised Dhillon to just move on and not risk going to prison and just focus on making money, and living the good life. Even some of those that helped prosecute him have said that Dhillon is a “smart guy” and should focus his talents on “making money” and ‘stop fighting a battle he can’t win’ against KPMG and the government. Dhillon’s response to them is that – “What they don’t understand is that there are things in this life that are much more important than money. If I walk away from this fight now, these big corporations and governments will think they can just run roughshod over the common people. And the next person might not be as fortunate to make it as far as I have”. If you’re unfamiliar with the nuts and bolts of Satinder’s case, here’s a primer: Satinder Dhillon was arrested at the request of multi-national conglomerate KPMG. On July 2, 2010, at approximately 10:30 in the morning, KPMG was able to get 9 Royal Canadian Mounted Police (RCMP) officers to go to Dhillon’s residence with a battering ram. He was woken by the officers, handcuffed without having been given the chance to change out of his pajamas, brush his teeth, or eat or drink anything. He was then driven in handcuffs approximately 45 minutes away from the city in which he lived to the RCMP detachment in Surrey, British Columbia and left in a cell for over four hours. Dhillon was so light headed by the end of the interrogation, that he felt as if he was going to fall off his chair while being questioned. (A full transcript and videotape is available online). During the interrogation one of the police officers went on record and stated the following: “let’s be honest right, they are accountable (KPMG), they should be held accountable”, but then soon thereafter says, “they’re gonna laugh at you, you’re gonna go off to jail, and they’re gonna laugh at you, and hey that’s, you know what, the facts”. He also further berates Dhillon, saying “Don’t go all Malcolm X on me, okay … Don’t get all Gandhi on me. He also told Dhillon that KPMG had put a “target on his back”. Dhillon finishes off the interogation by stating, “who’d thought that, the accountants in the world could do something like this”. Dhillon says he’s prepared for a prison term to defend the truth, if that’s what it takes in the end and he hopes this story will be able to touch the right people, and call for a new paradigm of thinking in Canada. “My case clearly shows how bad things have really gotten in Canada. We cannot live in a country that does not allow the truth to be used in court. You cannot have true freedom in a country, while that same country does not allow the truth to be used in one of its courtrooms” stated Dhillon. One of the ironies about Dhillon’s situation is that he was charged with the allegation of writing a blog almost 5 years ago, and before his trial ended earlier this year, he was given his own blog by the Huffington Post, (which was rated the world’s most powerful blog, by the Pulitzer prize winning newspaper, the Guardian). The government now wants to put Dhillon in jail for the allegation of writing a blog. As unbelievable as all of this sounds, it is happening in a first world country and this story is not from a place like Sudan, or North Korea, where one might expect a person’s rights to be taken away like this. What is even more shocking, is that to do all of this, the courts are using a colonial era law which is over 800 years old. The law itself is so old, that on the books it’s still technically punishable by death, even though Canada abolished the death penalty in 1976. Other countries have since modified the old law, but Canada has yet to do so. This law is also the last exception left under Common Law in Canada. Judge Heather Holmes also denied Dhillon the right to question any witnesses during his trial. She also did not let Dhillon look at a file that KPMG has been keeping secret for over for 15 years. A file which he is entitled to view by law. It has been alleged that KPMG has caused over $800 million in damages to Braich and his creditors and that a very large income tax fraud was committed by certain banks and accounting firms. This same judge denied Dhillon the right to even apply to have the trial televised (as he had requested). Dhillon was also denied a jury of his peers. Furthermore, Judge Holmes is also going to be the one that sentences him. By the time the next court session begins for this groundbreaking case, the actual trial itself will have taken over one year to complete, almost to the day. The build up to this case was preceded by over 15 years of history, and the outcome has major implications for generations to come, if Dhillon does not appeal the decision. Fortunately for Canadians, Dhillon has vowed to fight for as long as it takes, and eventually go to the Supreme Court of Canada, if need be, to make sure Canadians are not left without the right to use the truth in Canadian courts in the future. “As long as I’m alive, I will continue to battle against injustice. I was born in this country and if they could do this to me, they could do it to anybody, and that’s what’s really scary. What happened to me is nothing compared to what others go through in the world for speaking out against corruption. The only option is to fight back” added Dhillon. In fact, Dhillon was offered a deal by the government before the trial started, that if he removed the blog and made a donation to a justice youth group, that the case would be dropped. Dhillon refused to back down from the truth. Also, right before the trial started last year, Dhillon almost died. During the trial there was a wheelchair in the courtroom, pillow and yoga mat, just in case he collapsed while making his arguments. “I am just happy to have lived long enough to finish the trial and have the story finally be told” said Dhillon. Mr. Emmet Pierce who assisted Dhillon during the trial, stated “this was a total abuse of process and the taxpayers in Canada got screwed twice. Once when the banks and accounting firms committed tax fraud and then when taxpayer money was used in an attempt to silence my friend”. The blog that is alleged to have been written by Dhillon, outlined serious corruption in Canada. To this day no one has ever directly challenged any of the actual contents of the blog itself, instead court transcripts show legal chicanery, sidestepping, and avoidance at every turn. “I think the fact that I was not allowed to use the truth in court and was not allowed to view the file in KPMG’s possession, and was also not allowed to cross-examine any witnesses, speaks for itself. The due process was completely stripped away from me, and now they want to put me in jail. This is not why my parents immigrated to this country, and this is not why they sacrificed and help build this country”. Here’s what some judges in the Supreme Court of British Columbia have said about Mr. Dhillon, after hearing him deliver various arguments in the courts over the past 15 years. “Mr. Dhillon has a well developed sense of strategy” – Emmet Pierce echoing another Supreme Court of British Columbia Judge. “Some people think that corruption only exists in countries like India and that an anti-corruption movement is only needed there. But having gone through what we have in the past 15 years in Canada and having learned what we’ve learned, rest assured corruption exists in Canada at the highest levels and the former Chief of Staff for Prime Minister Jean Chretien, Senator Percy Downe is one of the only people speaking out about it in this country. This corruption needs to be rooted out before it causes any more damage to society” stated Dhillon. Dhillon, inspired by Arvind Kejriwal, and the change that happened in India, has founded an anti-corruption movement right here in Canada. “The PPC (People’s Party of Canada) is not about politics, it is much more than that. It is a movement to inform the citizens about what is really going on in this country. If they choose to vote for one of our anti-corruption candidates, then that is just a byproduct. This is bigger than politics”. “We want to inform the public about what is really happening in this country and provide a voice for those that perhaps usually don’t get out and vote because they feel that they have no voice. This is not about being left or right wing, and politics as usual. It’s about giving a voice to the voiceless and moving the country and humanity forward”. We salute citizens like Satinder Dhillon, because in the end, it’s people like him who risk their lives and stand up and fight corruption and injustice, that we are free to celebrate occasions such as Canada Day. We all need to stand united and keep on fighting however we can, otherwise days like Canada Day and other celebrations of independence around the world, don’t mean anything. Satinder Dhillon has been recognized as one of the Jewels of Punjab and was named as one of the Top 100 Global Punjabi Personalities in the world. He is 39 years old and he grew up in a small farming community in Canada. He attended Simon Fraser University and the University of the Fraser Valley. He was just 19 years old and a little more than halfway through completing a degree in Business Administration, when he was offered a job at HSBC Finance (formerly known as HFC), as a loans officer. Within 90 days of working at this job, became their number one employee in western Canada. He then went on to work for Canada’s largest credit union. Becoming one of the youngest Financial Services Officers in its history. Always the entrepreneur, he began purchasing real estate at a young age and trading stocks as a teen. At 19 years old he purchased a commercial/residential property with a partner. Backed by Penmore Investments, and Vector Capital, they took on a mortgage of over $1.1 million, and he made his first major foray into real estate, (one of the tenants was Starbucks Coffee Company). He has worked as a fundraiser for nonprofits including Greenpeace, Red Cross, the ADL (Anti-Defamation League) and PBS among others. Dhillon left working for Canada’s largest credit union, in his early twenties, and traveled around the world in search of business opportunities outside of British Columbia and outside of Canada. He has since learned much about the business world, corruption, white collar crimes and how different things are out there, compared to the little farming community he grew up in. Dhillon has financed mining, real estate, and many other projects.